A small comet barrelling towards Earth is set for its closest flyby in at least four centuries. Here’s everything you need to know to catch the remarkable comet jettisoning from Jupiter. Just how close are we talking? Comet 46P/Wirtanen will pass very close to Earth – in the context of the expanse of space – just 7 million miles (11 million kilometers) away on December 16 at 8:06 am EST (13:06 GMT). Essentially, there’s no need to cancel your Christmas plans. It will be the tenth closest comet approach to our planet since 1950, and the 20th closest since the ninth century AD, reports Sky and Telescope. An analysis of 46P/Wirtanen’s orbital motion for the past and future 200 years by Space.com revealed it will be the space rock’s closest approach to Earth in at least four centuries – and possibly for all time to come. A projected encounter in 2042 is expected to fire the comet farther out to space, meaning it could no longer possibly approach the Earth so closely ever again. Wirtanen is one of the more than 400 members of the Jupiter family of comets. 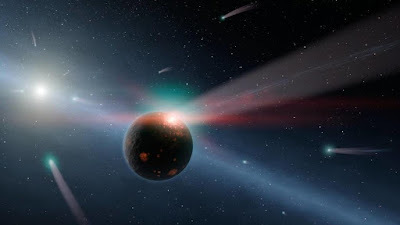 Particularly close interactions with the giant planet’s strong gravitational field in 1972 and 1984 pushed the comet about 51 million miles closer to the sun – and very near Earth’s orbit. With an orbital period of 5.4 years, 46P has been getting progressively closer to Earth and is now set for a remarkably close flyby, four days after its closest ever approach to the Sun. Will we be able to see it? At the point of its closest approach, 46P will be bright enough to be seen with a naked eye. However, its relatively dull light and very small size – it has a diameter of only around 1.1 km – mean it won’t exactly put on a dazzling show. Unlike big bright comets which usually light up the sky with reflective dust particles trailing behind in spectacular fashion, Wirtanen’s tail is not expected to be very impressive – if seen at all. Small comets like 46P tend to have long, thin, faint tails composed of mostly gases. At its closest approach when passing Earth the comet’s head will appear about twice the size of the moon. Amatuer astronomers are encouraged to travel away from city lights and polluted skies for their best chance at seeing the space ball as it whizzes by. The darker the sky the better; predawn hours are optimal in order to avoid light from the moon, and binoculars or a telescope will greatly enhance your view.